For a local opinion, check out this article by Sarah Pedersen, a sixth grade teacher in Richmond. Virginia is the eighth wealthiest state in the nation, and yet our teachers suffer under the single worst pay gap in the country. Our legislators have instituted the ninth worst budget cuts to education in the country. It is no secret that we are not funding our schools. The state of our buildings, our materials and the opportunities we are offering our young people are all well-documented and have been for years. The only secret is what it is going to take for our elected leaders to do something about it. Virginia per-pupil spending in higher education, $5,139 per student, is significantly lower than the national average of $6,954. As state appropriations for higher ed go down, tuition goes up. In fact Between 1992 and 2018, general fund appropriations to public higher education in Virginia fell from 14.4% to 10.2% of total state appropriations. This is just *one* reason why Focused Inquiry faculty are #RedForEd! Funding for public education matters! 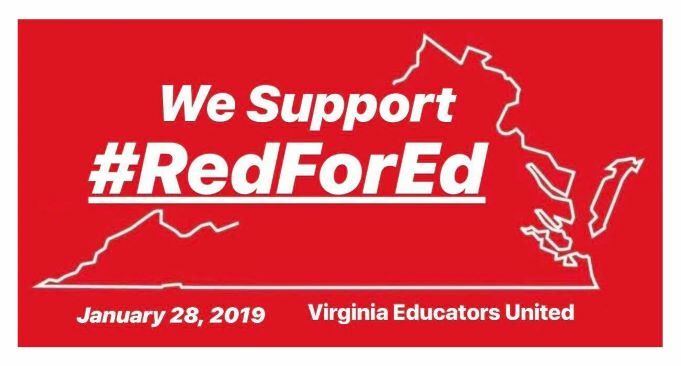 Support our schools, support our students. Looks like if you’re in the East End the closest location for pickup is at Armstrong High School (2300 Cool Ln). Please be mindful that all buses will leave at 10 AM. 11:00 AM Gather at 620 W. Main St. The route is about a mile. Noon – Rally on the Capitol Steps- strongly encouraged to wear red! 9 AM: Scheduled meetings with your legislators. The site mentions that “drop ins” are not possible so they encourage you to make appointments.